Birth of Samuel Frederick Caddick registered June quarter 1893 in Dudley. 43 Brook Road, Woodsetton, Staffordshire. Thomas Caddick (45, Iron Moulder, born Coseley), his wife Rebecca (43, born Coseley), and their 3 children: William (22, Iron Moulder, born Coseley), Frederick Samuel (7, born Coseley), and Charles A. (4, born Coseley). 43 Parkes Lane, Woodsetton, Staffordshire. Thomas Caddick (54, Iron Moulder, born Coseley), his wife Rebecca (54, born Coseley), and 1 of their 3 surviving children of 4: Samuel Frederick (17, Wages Clerk at Electrical Engineer, born Coseley). At the time of the 1911 census, Samuel was employed as a Wages Clerk. He was also a member of the South Staffs Territorials, who were at their annual camp when war was declared. Samuel had been home on leave during the last week in September, most likely with William Jones who was also on leave at that time. Samuel returned as the battalion was moving from Hill 60 to Vaudricourt, near Bethune. Here they trained and prepared before their move to Vermelles where they would go into action on 13th October. Both Samuel and William were killed on this day. The 1/6th South Staffs arrived in France between the 3st and 5th March 1915. They moved to Armentieres on 20th March and then to Fletre for further training. In April the battalion marched to Wulveringhem in Belgium alternating between trench duties and further training. In June 1915 they moved nearer to Ypres, and for the next 2 months spent time at the feared Hill 60. On 2st October the 1/6th moved back into France to take part in the second stage of the Loos Offensive. Further training preceded the march to the assembly trenches near Vermelles on 12th October. Samuel Caddick, like the majority of the men killed here, has no known grave and is commemorated on the Loos Memorial at Dud Corner, in sight of the Hohenzollern Redoubt. We regret to learn that Lance-Sergt S.F. Caddick is reported to have been killed in France. A comrade, who buried the body, forwarded the deceased’s pocket New Testament to the sorrowing parents at Parkes’ Lane, Woodsetton, near Dudley. the deceased soldier was 22 years of age and unmarried. 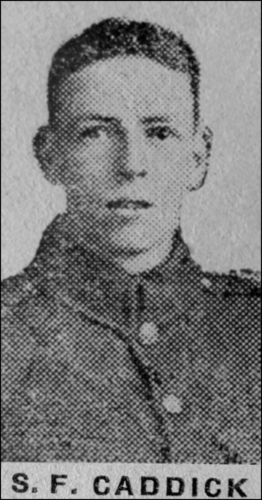 He was in the 6th South Staffs (Territorials) for over five years, having joined as a private in the original ‘E’ Company (Tipton). When mobilisation took place he was at once made Lance-Corporal. He had been at the front since March this year, and was home on short leave in September, when he was promoted to lance-Sergeant. He was an old scholar in the Sunday School at Providence Baptist Chapel, Coseley, and for many years was a member of the choir. He was loved by all who knew him for his bright and happy disposition, and his death is keenly felt by many friends. He was employed at Messrs. Bullers, Tipton. this is the first death recorded from the Providence Chapel Roll of Honour.